It snowed yesterday. Again. Our walkway is a permanent sheet of ice and our driveway isn't much better. This winter has been the worst one in my recent memory - I think we haven't seen the grass (brown though it may be) since Thanksgiving. Ned and Penny don't seem to mind being cooped up inside. Nanny came up with a new activity for the kids - watching the snow. Gave them a chance to digest their bottles while admiring the white fluff from a warm place. A few kid updates that you might enjoy: We took Penny for a 5 month weigh in last week and she came in just over 12 lbs (just under 10%). She is growing but we are still having problems getting her to eat even though we upped the dosage on her medicine (Prilosec). I have another call into the doctor but we keep missing each other (the only time I was unavailable yesterday was when I took a shower. Guess when she called?). I snuck Ned onto the scale (fully dressed) and he weighed in at 16 lbs!! The difference between the two of them is staggering as these photos shows you. We can't fit him in 3-6 month clothing anymore so I've washed and put away the 6-9 month clothing in their drawers (folded by lovely Nanny). Ned is really learning how to use the exersaucers and Penny is SO CLOSE to rolling over. Ned hasn't rolled over again since that one time. They are both putting weight on their feet when you hold them up. Penny has also become a chatterbox. It make take 40 mins to get her to eat 4 ounces but she is pretty happy once they are in her - blowing raspberries and sqwaking. They both love the solid foods - avocado was a bit hit this weekend and they think squash is the next best thing to sweet potato. Despite all my desires to make my own baby food I've been buying the Gerber Organics. We go through so much of it and frankly it is easier. I will finish out the frozen peas, green beans and keep making sweet potato and mashing avocados. Penny got her last bottle of breastmilk right around her fifth month birthday and I stopped breastfeeding Ned for his morning feeding a few days later. I was pumping next to nothing at night and Ned needed 4+ ounces after I BF him so it was easy to let it go. I'm surprised how okay with it I feel. They got mostly breastmilk (at least half their feedings) for almost 4 months and some for another month after that. I have noticed that Ned is much more of a snugly baby and I don't know if it is because I breastfed him. Penny has always been much stiffer when you hold her and she doesn't curl into you - could also be her reflux. 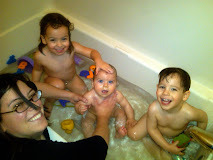 And of course right after I stopped the breastfeeding the kids picked up colds - from me! I also switched to powder formula to save money. We go through so much of it! I found the Dr. Brown's pitcher really helps for mixing it without lumps or lots of bubbles. It was a disaster the first time I tried to just shake the powder with water in the bottle! The only problem is that I can only mix about 32 ounces at a time so we have to mix a couple of times a day. Still lots to do on my To Do List before I get back to work. One big item is clothes - all the suits I was wearing before I got pregnant are 1 size too big so I may try to get them all tailored and taken in. Weird thing is I feel heavier (especially in the middle, thanks, my little tykes for the "twin skin") but I seem to be a size smaller than pre-pregnancy. Wish I had been able to lose a little more weight before I went back to work but maybe I'll be snacking less without playdates! I think when the Nanny comes next time I'm going to do a closet/drawer purge and make a list of what I need to buy. I packed up all my breastfeeding clothing for my sisters to look through. I love getting rid of stuff - not that you'd know it if you visited my house. It's amazing how much Ned looks like Aaron, don't you think? And the size difference is staggering. I'm trying to remember, was Ned the presenting baby and was he "born" first? Ned was presenting (Baby A) and was taken out first (C-Section). But he weighed only 5 lbs 5 ounces. Penny weighed 5 lbs 11 ounces - her umbilical cord was much thicker and took much longer to fall off (the doctor ended up using silver nitrate to "burn" it off). Wow - the size difference is HUGE in those pictures!